Thanks, Max! And about the Shilelagh: IIRC, one early account of the Irish noted that men often carried short axes for personal defense. There's a medieval illustration of Irish men fighting with these, but I can't find a copy online. I've often wondered if the Shilelagh is descended from those weapons--a somewhat less belligerent and more practical arm. ps edit - having played around with both types of A&A javelins I don't know how effective such lightweight "darts" would be against anyone in mail. I doubt that even with an ammentum that you would get penetration against anyone wearing a mail hauberk. otoh, many of the Scots and Irish only wore textile armour (cotun/jacks) and on the legs, often there was nothing at all (redshanks). this is just a personal opinion of course. in hand in relatively close quarters they could still be used as a one handed lightweight spear to pierce certain types of armour or unprotected gaps in armour. -The axe and shillelagh (and probably many other weapons) shared a somewhat common style of use, the shillelagh simply replaced the axe as an everyday weapon when weapon carry was banned. 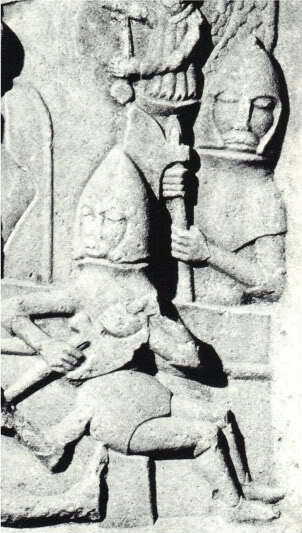 Shillelagh fighting offers a very plausible window into axe fighting, perhaps even dating to the Vikings, as Cambrensis mentions that the Irish actualy learned this way of axe fighting from the Danes and Norwegians. It is a rather unexplored path but one that I will surely take as soon as I find a suitable axe . Great to see you here Max. Here are some Irish Kern darts that I fashioned out of A&A javelins. The vanes are made of leather and are tied off with artificial sinew in the same fashion goose feathers were tied off with thread on medieval arrows. I have to say that since I put the vanes on the darts, they fly beautiflully. one question about the spears: could the "strap"/"weight"/ribbon/pompom after the head be just a kind of material wrapping used to prevent enemies' blood from dripping along the shaft and making the wood slippery? It's a standard explanation for wrapping/tassels/fringes on Chinese spears. The sections on spear in the Korean manual(s) show spears with fringes (pics probably copied from earlier Ming manuals), but IIRC says nothing about function. The usual explanation of function of Japanese wrappings is "hand-stop", and also to stop enemy blades sliding down. I've seen African wrappings of iron wire, so strengthening, not blood-stopping. Ditto Philippino spears with brass wire wrappings. Heavy iron wrapping on Tibetan spears look like long spiral langets. So, it's given as a modern explanation. Not always as the primary purpose; this is sometimes stated as being to distract the enemy, to divert attention from the point. I don't believe it as an explanation. Perhaps it's a secondary, or tertiary, function, at most. Just another thought on the wire/cord wrapped shafts. Could the wrapping be there to secure a tanged head? Yes, or at least to strengthen the shaft around the tang. But this isn't the whole story - I have two African spears with the same style of iron wire wrapping, and one is tanged and the other socketed. I suspect multiple functions, with important ones being fashion and decoration. I'm eager to see your results! I still have the swallowtail arrow heads I bought for my improved project, but haven't yet hafted them. I also still have the brass tacks and plywood disk I cut to make an Irish target--two projects on the "someday" list. What do you plan to use for your birin heads? Did you put on 2 or 3 vanes?It looks like 2 on the pictures. Did you only tie them or did you use glue as well? How long are these darts? Appologies in advance for the thread zombification, but I thought it might be best to keep questions centralized instead of a new thread. If that was the wrong decision, let me know and I'll start a new one instead. So, does anyone know where the drawing I've attached was published? The picture text says "JRHAA1873", but I'm not aware of any journal titled that. The RSAI was known as the Royal Historical and Archaeological Association of Ireland in 1873, though, so maybe the JRSAI was called that at the time, but I looked through their catalogs for 1873 and didn't see anything about Felim's tomb or Roscommon Abbey. I'd love to get my hands on the rest of whatever article that came out of, along with any other drawings. Have the carvings really degraded so much in 130 or so years? There's not anywhere near that level of detail currently visible. Also, does anyone know if there have been any new studies done of the helmet from the Ulster Museum? The one that looks a bit like a barbute/bascinet hybrid? I know there have been rumors or discussions that it might be a fake, does anyone know? 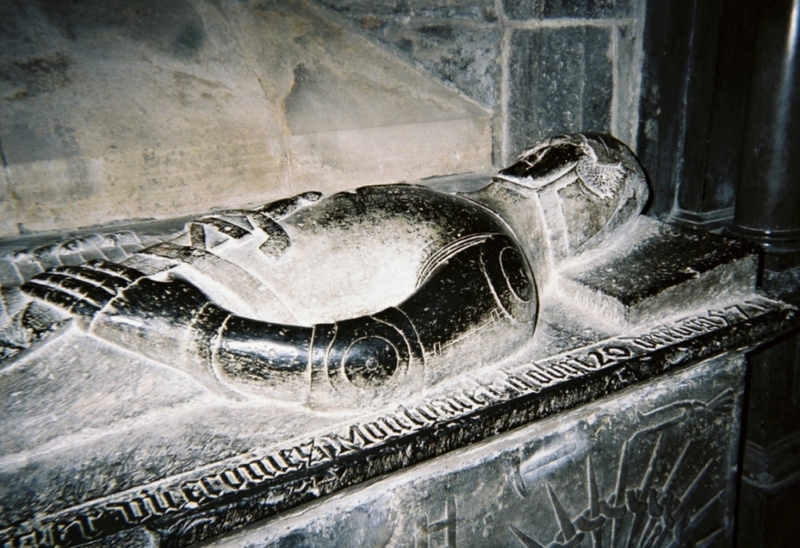 I haven't heard that the barbute found in County Down is fake. Would be interested to hear more about that. 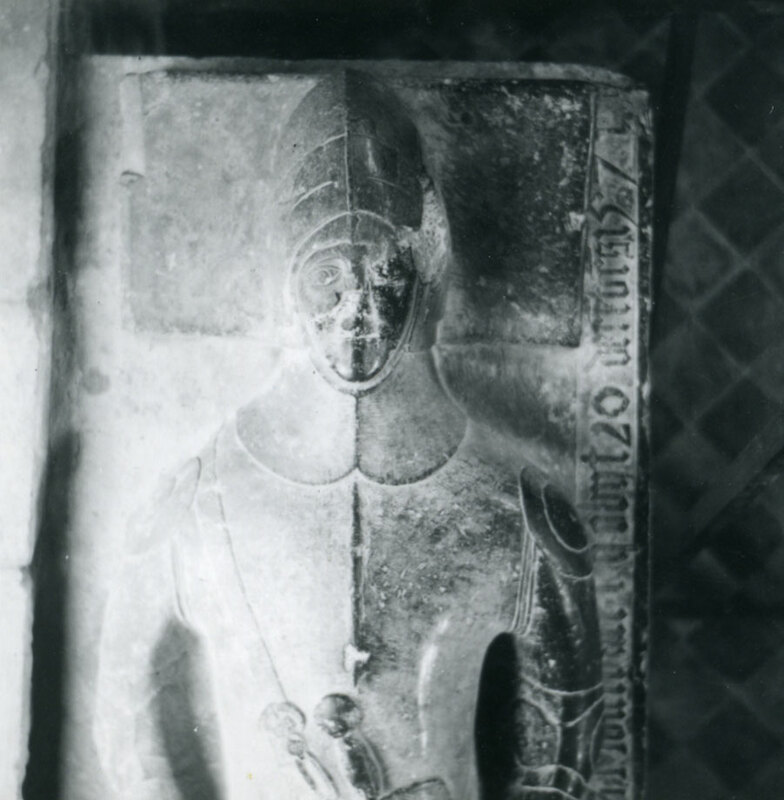 Last month I had an argument with another member about ring hilted swords and had pulled out John Hunt's book to look it over again as I was interested in searching in the back of volume 2 where the tomb surrounds and other medieval architectural stone works are pictured. 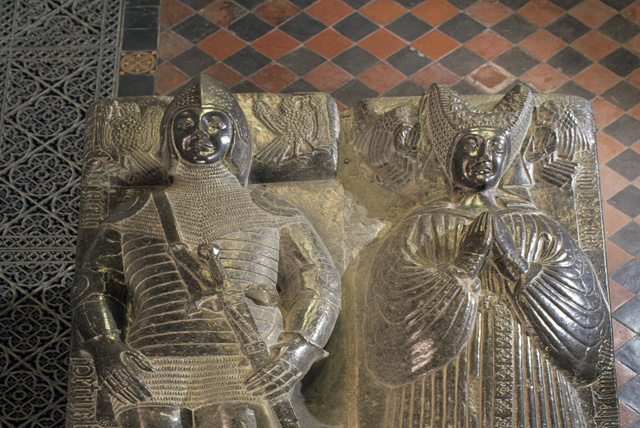 I noticed for the first time two particular scultured panels from circa 1470 illustrating the crucification where the Roman soldiers are depicted as contemporary galloglass with barbutes and sparths. I don't know why I had not noticed that before. 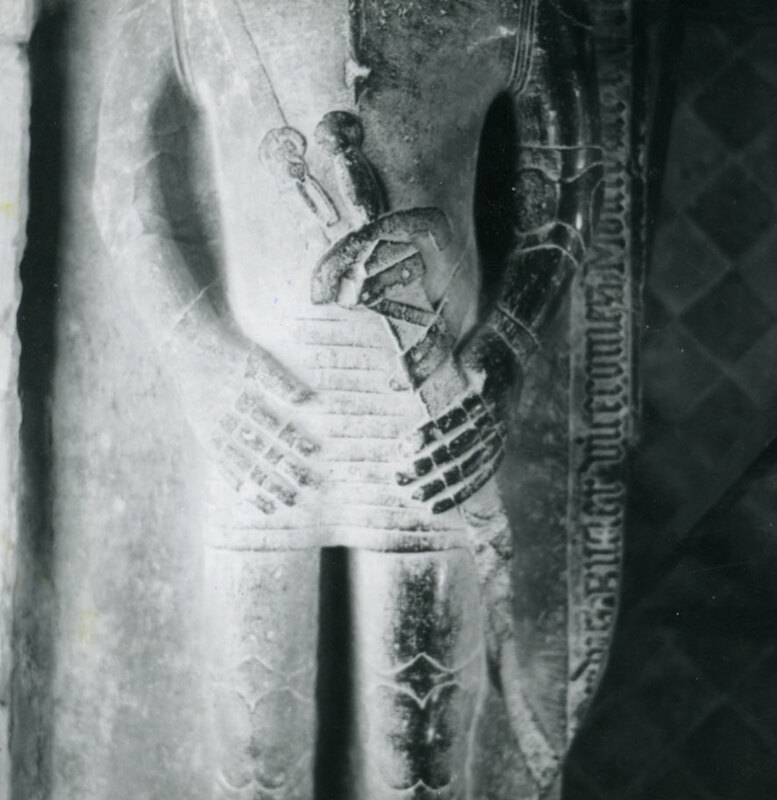 The particular panel,along the edge of the Creagh tomb in the friary in Ennis, Clare, is contemporary with the carvings showing the knight with barbute at Jerpoint, and looks a lot like the barbute found in Lough Henney posted earlier.... the helms look a bit like a type of a basinet, but also a barbute with a nasal and a bit of a wrap around on the cheek plates and no attached mail aventail. While I am at it tonight might as well scan and post this old postcard that I was just recently sent. 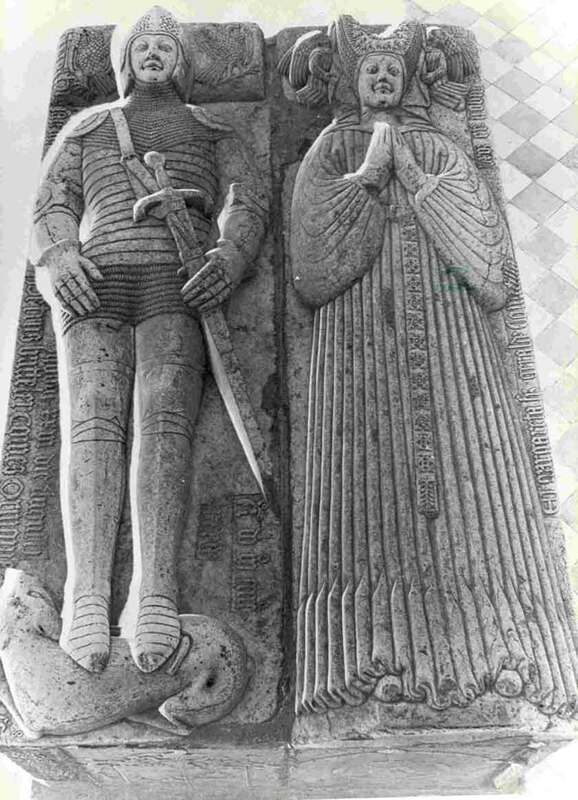 It is a photo of Piers Butler and Margaret Fitzgerald at St Canice's (1539)- there are many pictures of this tomb but this is a nice one - appears to have been taken from a ladder looking down. postcard is postmarked 1978. 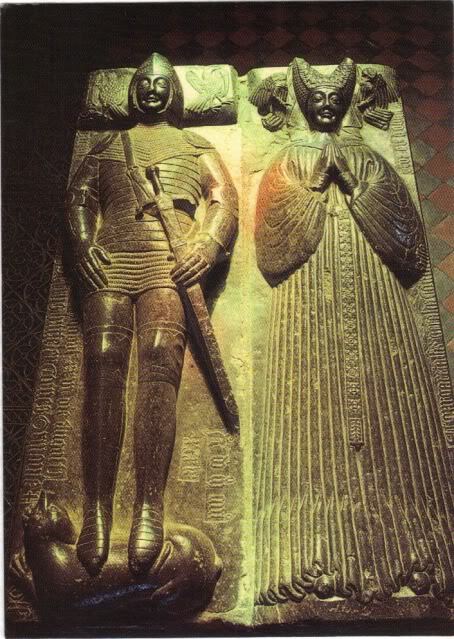 What is interesting is that Irish armour of the late 15th and early 16th centuries look, at least from these image in the above posts, very much " Old fashioned " and almost 14th century transitional armour. 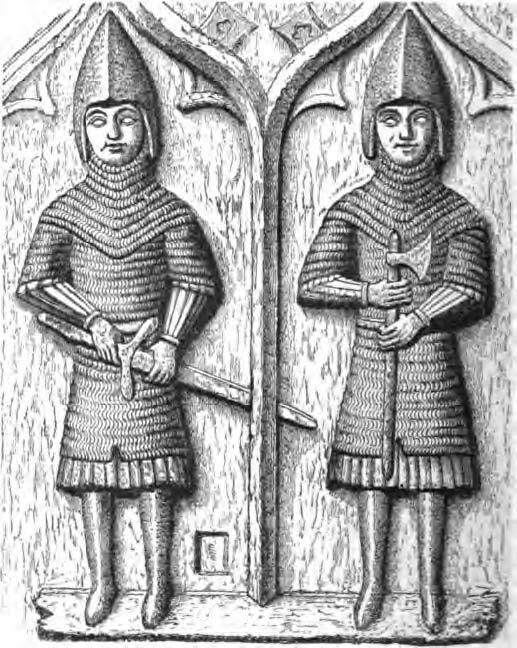 The helms sort of related in appearance to bascinet/barbute and even close to a classic Norman nasal helm with or without the nasal. ( Hard to tell for sure if there is a nasal or it's just the way the nose is carved ? ). Fighting style(s) might also be an issue as I tend to think of maille based armours plus some plate in the transitional style have advantages in comfort and wearability for small scale fighting resembling unfriendly feuds between neighbours rather than large set battles: More flexibility in how much coverage in the sense that a lot of the plate can be left off if one want to maximize mobility or agility. So, maybe it's because Ireland was more of a primitive backwater ( no offence meant ), poorer so that expensive kit might be rarer, old armour still being used until truly worn out, fighting styles and maybe just a conservative and pridefull attachment to the older forms of kit ?